Your home most likely offers multiple sites where your spa may be installed. Use the information presented here to assist you in carefully selecting the site that works best for you. It is your responsibility to choose and prepare the site properly before delivery, so you will experience a smooth and efficient delivery as well as obtain optimal use and full enjoyment of your spa. A – Obstacles such as overhanging tree limbs, awnings, protruding gas meters, water meters, and A/C units can prevent easy access. B – WARNING: Watch for power lines. C – It may be necessary to remove a gate, part of a fence, or other items in order to dolly the spa to the desired location. General Guidelines: Select a structurally sound flat surface that is reasonably level to serve as your spa’s foundation. A foundation that shifts or settles may cause stress to the spa shell. The foundation that your spa rests on must have a weight bearing load capability of supporting the weight of your spa, its water, and the people using it. The maximum filled weight of a spa can be as much as 6,000 lbs (2,722 kg), plus the weight of the occupants that use the spa. If your spa’s pad is slightly sloped it will not affect the performance of the spa or its structure, however, there should be no dips, sags, or unevenness in the pad. Most patios are built to slope away from the house for drainage purposes. There should be no more than a ½” (1.27cm) slope in an 8‘ (2.44m) run. Recommended flooring materials include a concrete pad, concrete pavers or bricks, pea gravel, or crushed rock (1.5” [3.81cm] or less), or a reinforced deck. 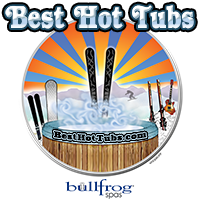 Additionally, your authorized Bullfrog Spa dealer should sell or recommend pre-formed spa pads. NOTE: Concrete foundations should be a minimum of 4” (10.16cm) thick and should be reinforced with either rebar or mesh. For electrical grounding purposes, the rebar or mesh should be attached to a bond wire. Step 9: Perform GFCI trip test.